It looks like another port is moving to protect its main business - parking. The Port of Galveston has filed a whopping 261% increase in what they are charging private parking lot operators to be able to bring their vans to the cruise terminal to pick up and drop off customers. The off-port operators are currently charging less for parking than the port is charging for their parking adjacent to the cruise terminals. But the parking lot operators aren't taking it lying down. Costa today inked an agreement with Trenitalia for a Rail/Cruise program that will provide a somewhat seamless connection from a passenger’s home rail station (in Italy) to the port city, a transfer to the port and the cruise for him and his luggage. When Carnival Freedom returned to service after a multi-million-dollar refurbishment, aboard were two new highly-promoted features for kids that will eventually go fleetwide. 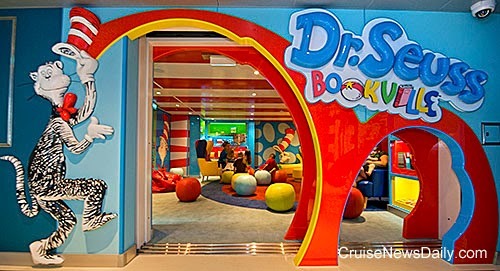 Both Dr Seuss Bookville (a family reading room) and Camp Ocean have been announced previously, but Carnival Freedom is their first actual installation on a ship. The US State Department has issued a new warning against travel to Honduras due to the level of crime in country, updating its warning of last December. The warning acknowledges that the government does keep crime to a lower level in tourist areas, but it says it is still unacceptably high. The main problem would seem to be that the police are ineffective and rarely solve a case. CND subscribers also read about now you can see it ... and a Dutch idol. Photo courtesy of Carnival Cruise Lines and Andy Newman. All rights reserved. May not be copied or used without permission. 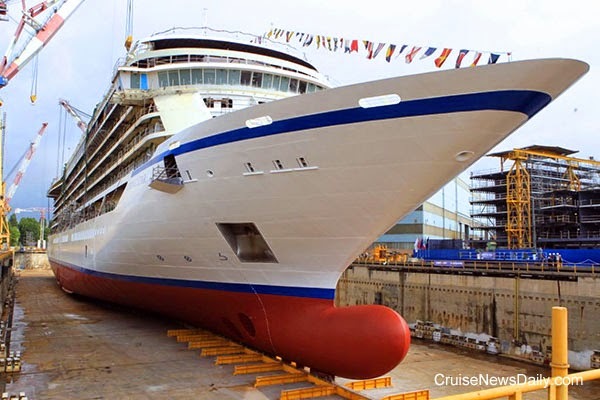 Fincantieri floated out Viking Cruise Line's first oceangoing ship at their Marghera yard on Monday (June 23, 2014), signaling the end of the construction phase. The ship has now been towed to a finishing dock where it will be fitted out. The 930-passenger Viking Star is the first of three on order, and will be delivered in early 2015. Viking Star sitting on the supports where it was built, shortly before the dry dock was flooded. 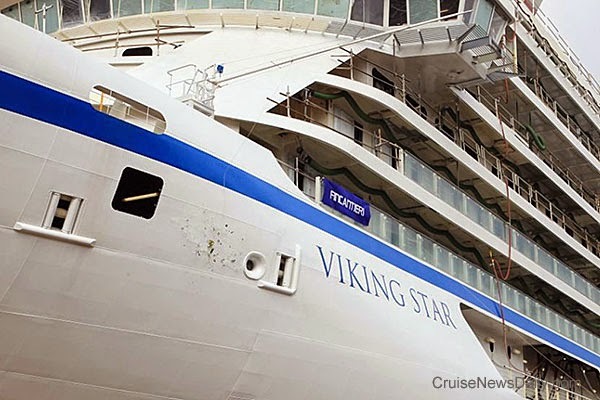 With a break of the bottle, the water began filling the dry dock enabling Viking Star to float for the first time. Seattle, Wash., June 26, 2014 – Holland America Line has promoted Jack Littlemore to director, revenue management operations, and Gabrielle Smith to deputy director, systems user support and operations support, both in the Revenue Management Department. Littlemore will report to Beth Bodensteiner, Holland America Line’s vice president, revenue management and product marketing, and Smith will report to Littlemore. Littlemore will oversee the ship inventory and operations support groups in his new role. Additionally, he will be responsible for the systems user support group. He is an expert on the company’s reservations management system (POLAR) and has been in the revenue management department since 2006. Littlemore began his career with Holland America Line in 2001 and held various positions prior to joining revenue management. Smith will manage the newly combined groups of operations support and systems user support with an emphasis on booking tools. She joined Holland America Line in 1989 and is also a POLAR expert. Until being named deputy director, systems user support and operations support, she was manager, systems user support. She held various positions throughout the company prior to her promotion. With a final meeting of the Conferenza dei Servizi in Rome today, it would seem Costa Concordia is ready to be towed away from the place where it has rested for the last two and a half years. The only thing undecided is a final decision on where it will be dismantled. Carnival Cruise Lines has a lot of signature features - small things that make Carnival, Carnival - everything from their specialty burgers at Guy’s Burger Joint to their legendary towel animals you find on your bed at night. Now Carnival wants to show you exactly how they create some of them, and maybe with the experts’ instructions you can recreate one of Carnival’s signature experiences at home. Sometimes you go to a cocktail party and the hors d’oeuvres are so many and delicious that you just can’t stop eating them. When you leave, you realize that even as varied as they were, you’ve made the little bites into an entire meal out. That was the case with Carnival’s quarterly earnings call today. There were so many interesting little nuggets that they were satisfying all by themselves. 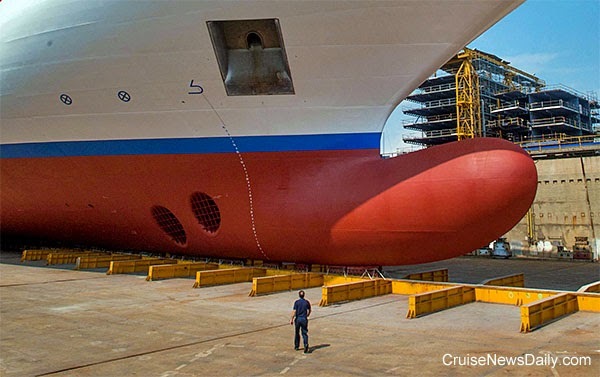 Viking Cruises’ first oceangoing newbuild was launched today at Fincantieri’s Marghera yard, and it will soon be moved from the dry dock to the fitting out dock. CND subscribers also read about it seemed like a good idea at the time ... and dining hundreds of miles from the ship.